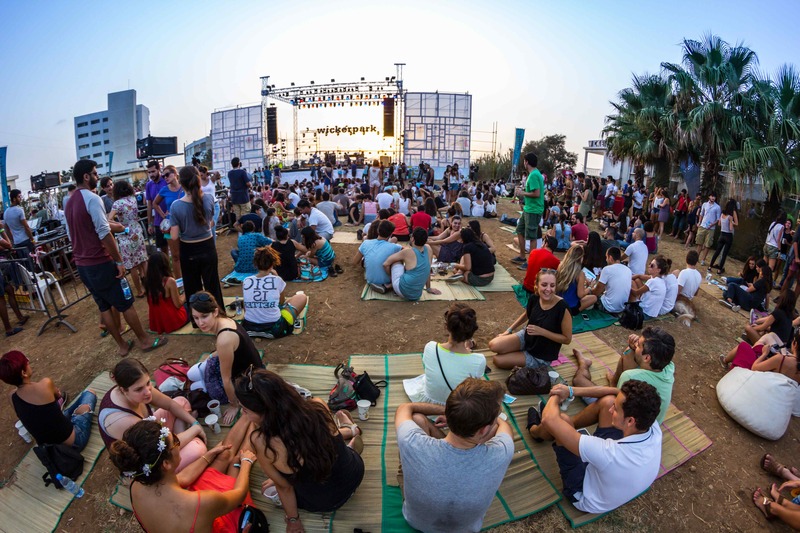 The Wickerpark music festival in picturesque Batroun has been dubbed the “Lebanese Coachella”, and although its size is proportional to that of little Lebanon, the festival certainly has a huge personality. A stage was erected on the 3,000 square meter seafront space, surrounded by bars, food stands, and more. A variety of artists, NGOs such as Donner Sang Compter, Beirut Green Project, and Live Love Beirut, as well as local designers all had booths showcasing their causes and products. There was also an off-festival program on the Saturday preceding the festival including a workshop by startup space AltCity, followed by a pre-party at White Beach, and a camping area. Festival favorite Charlie Rayne was brought back for a surprise opening performance for the early birds who managed to catch him in the late afternoon. The rest of the lineup featured Aufgang, a group well-established in France but relatively new to Lebanon; ABBY visiting from Berlin with their hot hybrid sounds; Alif band featuring beautiful Arab-inspired sounds; Postcards, back for another time with material from their just-released album; La Mirza & Rayess Bek paying homage to old Arabic music and cinema; OMMM, who created a continuous 30-minute piece just for the festival; and the beats of DJ Diamond Setter to end the weekend on a high note. Daou says music is Wickerpark’s number one cause but it’s more than that. “I think that if you live in Lebanon, just the fact that we are having such an event is a statement. Lebanon is so full of politics, and we are not political in any way. We represent a certain mentality, a music culture,” he explains. But hosting a fun music festival is no excuse to be dirty. While Lebanon is only now catching up with recycling in light of the ongoing trash tragedy, the annual event has been green for some time. This year’s festival pursued a “zero waste” policy, meaning trash from the day was sorted on site by Cedar Environmental and later taken to be recycled. Moreover, recycled paper was used for cups and tickets. In the long run, festival proceeds fund environmental efforts, specifically those pertaining to the famously beautiful sea in Batroun. Through research with scientists Dr. Gaby Khalaf and Ziad Samaha, organizers have the ambitious goal of cleaning seawater using the most natural of methods – sea urchins and sponges that eat bacteria and essentially filter the sea. The team is currently setting up an underwater settlement for sea sponges. Though Daou admits it’s a wishful project requiring follow-up and full of potential complications, they are trying hard to make it work.